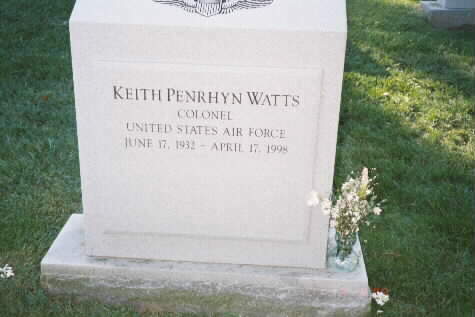 Keith Penrhyn Watts, 65, a retired Air Force Colonel and aerospace executive, died of prostate cancer April 17, 1998 at his home in Fairfax Station, Virginia. Colonel Watts enlisted in the U.S. Air Force in 1951 shortly after immigrating to Massillon, Ohio, from his native London. A naturalized citizen, he rose through the ranks to become a fighter pilot and a nuclear policy strategist. An F-100 fighter pilot, he flew combat missions in the Vietnam War and served in various fighter operations and pilot training assignments. He received a Legion of Merit for pioneering work in the development of computerized applications for Air Training Command. He had assignments with the Joint Chiefs of Staff, Supreme Headquarters Allied Powers Europe and Pacific Command Headquarters as a nuclear policy strategist. He also served as base commander of Spangdahlem Air Base, Germany. In addition to his Legion of Merit, his military decorations include the Defense Superior Service Medal, Distinguished Flying Cross, Bronze Star, Meritorious Service Medal and Air Medal. After his military retirement in 1982, Colonel Watts worked with Science Applications International Corp. as a defense analyst specializing in nuclear warfare issues. He retired last year because of health reasons. His marriage to Dolores Barron ended in divorce. Survivors include his wife of 21 years, Constance Coury Watts of Fairfax Station; four children from his first marriage, Laurie Watts Wetherholt of Austin, Linda Watts Smeck of San Jose, David K. Watts of Campbell, Calif., and Douglas P. Watts of Saratoga, Calif.; two sisters; and eight grandchildren. On Friday, April 17, 1998, at his home, beloved husband of Constance C. Watts; father of Laurie Watts Wetherholt, Austin, Texas, Linda Watts Smeck, David Keith Watts and Douglas Penrhyn Watts, San Francisco Bay area. Also survived by eight grandchildren. Funeral service will be held at Fort Myer Chapel on Monday, May 4 at 1 p.m. Interment Arlington National Cemetery. In lieu of flowers, contributions may be made to ARCS Foundation, Inc., 9536 Bexhill Rd., Kensington, Maryland 20895-3161 or Hospice of Northern Virginia, 6400 Arlington Blvd., Suite 1000, Falls Church, Virginia 22042.